WASHINGTON, DC, July 12, 2011 (ENS) – An innovative commercial-scale facility to make ethanol from corncobs, leaves, husks and stalks will receive financial support from the Obama administration. Energy Secretary Steven Chu has offered a conditional commitment for a $105 million loan guarantee to support development of the new plant, nicknamed Project Liberty. The world’s largest ethanol producer, POET, LLC, is building the plant, which is designed to produce up to 25 million gallons of ethanol per year. The new facility will be located in Emmetsburg, Iowa next to an existing POET grain-ethanol plant. The two plants will share roads and land, and the biogas that is a co-product of the cellulosic ethanol production process will power both facilities. POET estimates the facility will generate some 40 permanent jobs and will bring millions of dollars in new revenue to area farmers. The process uses enzymes to convert the corn cobs, leaves, husk and some stalk that passes through the combine during harvest into ethanol fuel. Ethanol production uses about 25 percent of the material, leaving 75 percent on the ground for erosion control and soil enrichment. 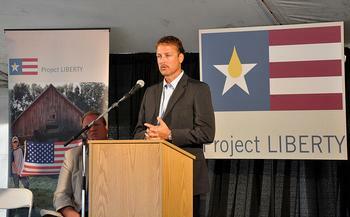 POET already operates a pilot-scale cellulosic ethanol plant and will commercialize the process in Emmetsburg. Project Liberty will displace over 13.5 million gallons of gasoline annually and fulfill more than 25 percent of the projected 2013 Renewable Fuel Standard Requirement for biomass-based cellulosic ethanol. POET CEO Jeff Broin said he’s excited that the company is about to achieve its goal of bringing new renewable fuel technology to commercial scale. In anticipation of this agreement, POET began construction at the Emmetsburg site last year with a 22-acre integrated stackyard to store the biomass delivered by area farmers. The loan guarantee, if finalized, will allow construction to remain on schedule for completion in 2013. Last year, 85 farmers around Emmetsburg harvested 56,000 tons of biomass and delivered it to POET’s stackyard. That effort will expand this year in a gradual ramp-up to the 300,000 tons of biomass Project Liberty will need annually by the time it starts operating. Project Liberty is carbon negative; it achieves a 111 percent reduction in greenhouse gases, according to a third-party life cycle analysis. The fact that the plant uses the residue from an existing crop and produces its own power from the waste stream are major factors in that reduction. “Projects like the one we are announcing today show that our investments in next generation biofuels are paying off,” said Agriculture Secretary Tom Vilsack, a former Iowa governor. “This project is an important step in the Obama administration’s effort to break our nation’s unsustainable dependence on foreign oil and move toward a clean energy economy,” Vilsack said. 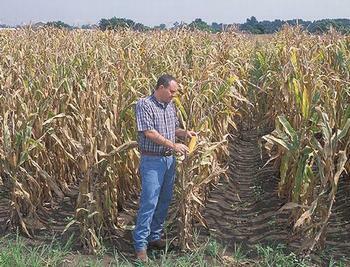 Enzymes are the key to unlocking cellulosic ethanol. POET plans to use its proprietary enzymatic hydrolysis technology to convert other sources into fuel, including switchgrass and wood chips. The 23-year-old company already produces more than 1.7 billion gallons of ethanol and 10 billion pounds of high-protein animal feed annually from 27 facilities nationwide. Broin says POET plans to replicate its unique enzymatic process at all of the company’s other corn ethanol facilities, which would have a projected combined annual capacity of one billion gallons per year of cellulosic ethanol. Fourteen other companies in the United States have cellulosic ethanol demonstration plants in various stages of planning, construction and operation. Other demonstration-scale facilities are operating in Canada, Germany, Spain, and Sweden. On April 12, the Italy-based Mossi & Ghisolfi Group broke ground for its 13 million gallon per year cellulosic ethanol facility in northwestern Italy. The project will be the largest cellulosic ethanol project in the world, 10 times larger than any of the currently operating demonstration-scale facilities.